OK. I admit it. I love Taylor Swift. 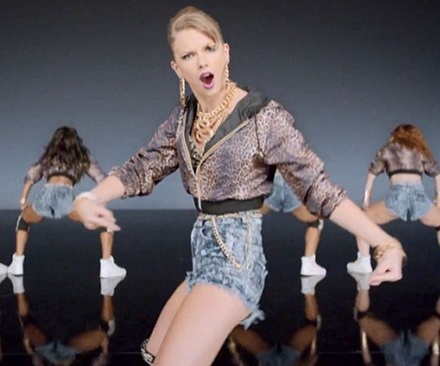 I am a mid-30s professional woman, mother of 1, and I love Taylor Swift. I love to sing along in the car. I love to dance around my sewing room. I find myself telling my son, when he stumbles, to get back up and Shake It Off. So when I saw this contest, I figured it was time to come out the TSwift closet and have some real fun. In the video, Taylor wears a bunch of oddball costumes while being kind of a weirdo. I though about making pancake tutus or cheerleader costumes for my dogs, but they reallyreally hate Halloween and I just couldn’t bring myself to do that to them twice in one year. I also thought about making a little hiphop outfit for my son, but then thought my husband might never speak to me again. But I kept coming back to the Iggy-esque outfit with the cropped leopard jacket and high-waist denim bootie shorts. I would never, never (ever, ever) wear anything like that in real life but then WHAM- I saw that snake necklace and new just what to do. TSwift is about to get Steampunk’d! 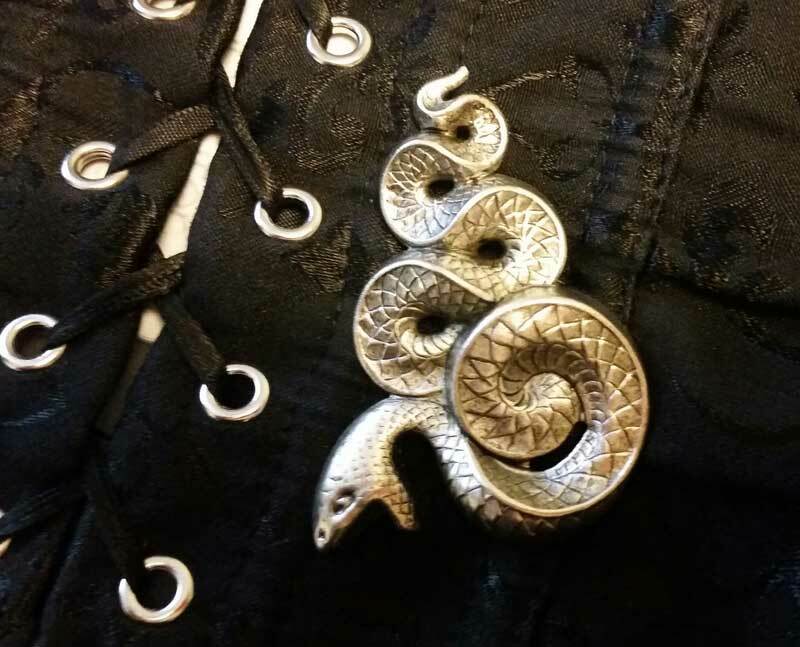 I ordered this snake charm from an Etsy shop ages ago, with the intention of making a little hairclip. It has since sat in my drawer collecting dust next to the octopus and anchors. So I scoured all the patterns by the 14 (!) sponsors of the contest and found a couple that would work, along with a few in my collection that I can use to fill in the gaps. 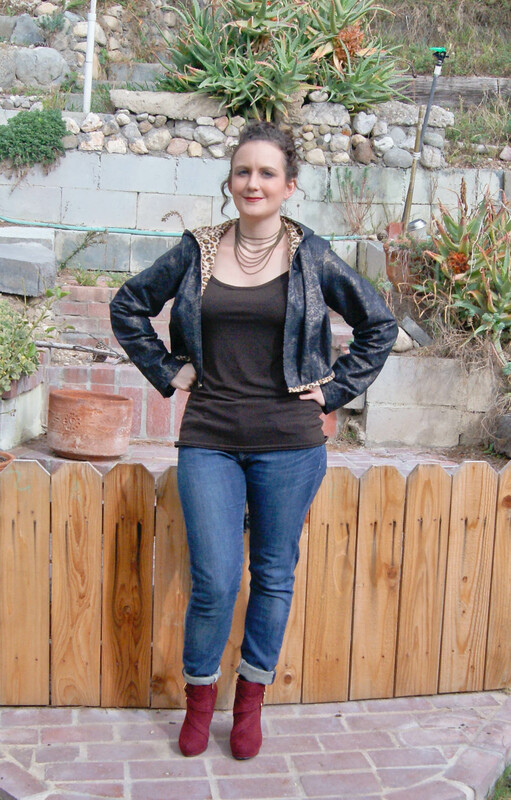 My goal overall is to stay close to the TSwift look (denim, leopard, chains, Iggy Azalea), while also transforming it to be Steampunk in every possible way. 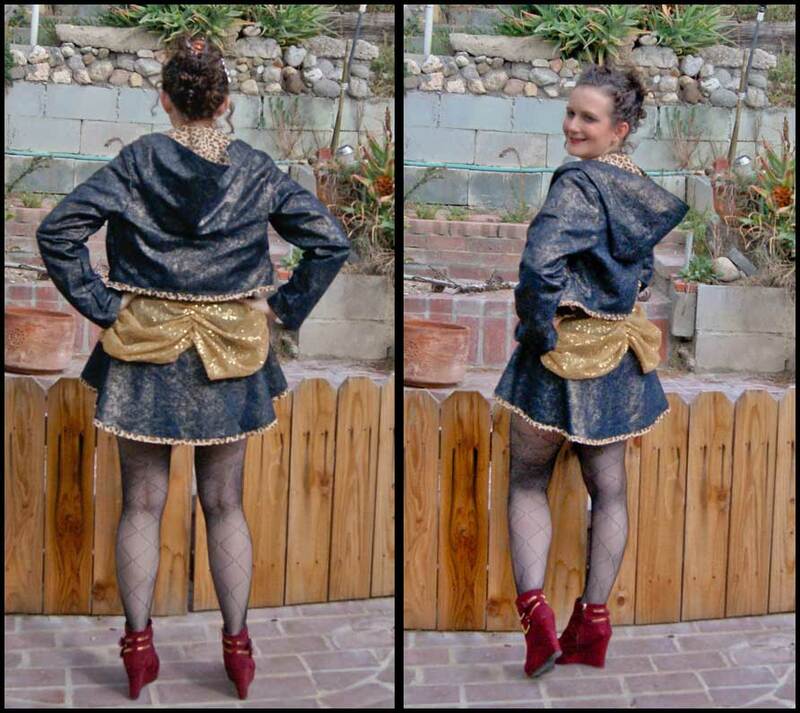 Betsey Apron by Sisboom: worn backwards, and modified o add a gold tulle sequined bustle (only temporary- not so practical for kitchen work!). This is the only pattern I had to buy just for this- I had all the others already. And I know I will make a ton of these as regular aprons, so it’s a pretty good investment. Straight Palazzos by Patterns for Pirates : Shorts length, because no one wants to see me in a front-less bustle without a little cover up! Andover Pullover by Terra’s Treasures: Pattern is not from a contest sponsor, but I needed a hoodie pattern I could make in woven and fully line. I also really love the chest strap, but ended up abandoning it because I liked the boxier silhouette once I had it all made up. I modified it quite a bit to crop the length, do a zipper-less jacket, and edge the hem with double-fold bias tape I made from the lining. Shoreline Tank by Jocole: Also not from a contest sponsor, but I wanted to be sure I had something to wear under the cropped hoodie, and this is a great basic tank. Day 1: Pre-wash ALL the fabrics. Print the patterns, assemble, and trace the right size for all pattern pieces. Factor in 1 extra layer for the Betsy bustle, and chop the Andover to hit right at my natural waistline. Normally I would make a muslin to figure out the right length, but I don’t have time for that, so I cut it a little long, and trimmed as needed. Grab the fabric from the dryer while still hot so I don’t have to iron anything. Day 2/ Early morning and Naptime: Start with the easiest things first: cut the pieces for the Shoreline tank and Palazzo shorts. Speed through as much of the assembly as is possible. Pray for a looooong nap. Day 2/ Bedtime: Make Betsy. Admire the gold print on the stretch denim. Fuss with the bustle. Hopefully get started on the Andover. Day 3/ Early morning and Naptime: Finish up whatever is left over from the tank, shorts, and apron. Get going on the Andover. Pray for a looooong nap. Day 3/ Bedtime: Finish up the Andover. Ponder how to reconcile the oddly different lengths between the lining and outer, both the bodice and sleeves. Day… ? : Took me a while to find time during daylight to get pics. Make self presentable. Hubby went out of town, so ponder how to take selfies that don’t look like selfies. Find the camera remote control I forgot about, pray the battery isn’t dead. Then write this all up and get it posted! Say a little prayer of gratitude because it started pouring rain about 15 minutes after I brought in the camera. Here’s how it came out! Overall I love all the individual pieces, and even if the finished look isn’t exactly what I had in mid, it’s pretty close, and I love that this forced me to sew outside my normal style and comfort zone. I didn’t like any of the front shots, so you can’t see the Shoreline Tank or Palazzo Shorts, but believe me, they are there (the tank is shown in my pic with the skinny jeans)! You also can’t really see the snake, but it’s in my hair. I finally made the hair clip! And, I totally love the cropped hoodie, and I think I’m going to wear it every day! Thank you! I had so much fun putting this together and trying to think “outside the pattern”!